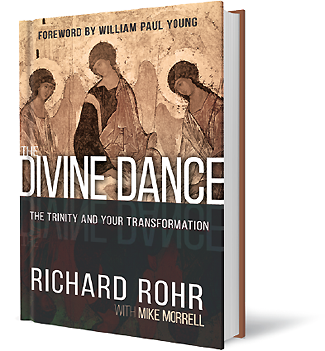 As our broken, disconnected world dances on the precipice of widespread civil unrest, The Divine Dance, by Richard Rohr and Mike Morrell, is quietly and gently calling us toward another dance – and ultimately a reflective, spiritually transforming revolution. In this latest installment of wisdom from Richard Rohr, a Franciscan teacher and man I’m increasingly finding myself a willing disciple of, readers are challenged to take a fresh look at the mystery of the Trinity. This book is extremely timely given the sharp left-right political, economic and religious divisions which presently exist – as well as the tendency of Christians to ignore or ridicule the other major wisdom traditions, such as Buddhism, Hinduism and especially Islam. The Divine Dance is calling the entire faith community to embrace contemplation and a major restoration of the mystery and majesty of participatory Christianity, which thrived during the first three centuries of the Christian faith, and he believes is leading up to a “Trinitarian Revolution.” This mostly internal revolution has the potential to help heal and bring together our fragmented world. Rohr believes, “God has become a very contested idea today…debates argued, wars waged and hearts broken trying to own, define or even relate to this being.” Gaining more intimacy and relationship with a loving God can help serve as a bridge over today’s cultural impasse. He bravely leads seekers on a journey of self-discovery of what’s going on inside the Godhead. Rohr is announcing the end of spectator spirituality which today still dominates the church, Catholic and Protestant. In its place, Rohr teaches readers how to flow into participation with the Trinity so that heaven is reflected in us, on earth, as we prepare for eternity. Rohr’s premise, running through all of his books, is simply: “The way down is the way up.” This requires letting our self-guard down and permitting God’s spirit to rule our hearts, minds, words and actions. When Jesus prays in John 17 that believers are taken “out of the world”, He is speaking of being taken out of the world’s system of thinking and values, which Rohr says are “almost always going in the opposite direction of the mystery of the Trinity.” And I would add, the opposite direction of the Kingdom of God. If you’re like me, likely you’ll find yourself underlining key statements for future reference and reflection. Below are 35 of my biggest takeaways from my first read of this important book. My prayer is that these short quotes will help give you a glimpse of why this may be Rohr’s most transformational book yet – and what you might gain (and lose) by reading it yourself. PART TWO – WHY THE TRINITY? WHY NOW?